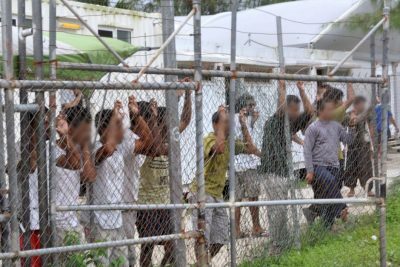 There are standoffs, threats and continuing tensions over the imminent closure of the Manus Island Detention Centre. (The politically palatable term here is “processing centre”.) This closure, instigated by legal ruling by the Papua New Guinea Supreme Court in April 2016, has led to a degree of window dressing, prevarication and stalling by all parties connected with the institutionalised barbarism that has been inflicted on refugees and asylum seekers. Central to the PNG tactics of removal will be the deployment of the PNG mobile squad, famed for their brutality and expert mishandling. Extra personnel are being deployed ahead of the closure on the pretext that they are the ones to protect the populace. The actual ones in danger are the refugees and asylum seekers in the camp itself who fear marauding locals indifferent to the dark deals done between PNG and Australia. The social nightmare that has arisen was a case of pure engineering on the part of the Australian government, keen to sustain a gulag-styled system of camp processing and control supposedly designed to deter arrivals. Absurdist claims that refugees could settle in PNG as a land of smooth milk and enticing honey have become the fare of successive administrations in Canberra. The PNG politicians tend to have mixed feelings about their large, insistent neighbour. The refugees, spanning a range of countries as diverse as Iran and Myanmar, are sore intrusions into a locality of 6,000 residents. White man’s burden is a testy one, and shouldering it in a modern pseudo-colonial context has not been a thrill. Human Rights Watch has been on the case of the Manus Island Centre for some time, and the picture has merely become more hideous with time. In 2015, the organisation noted instances of severe abuse, inhumane treatment and neglect. Another report released on October 25 makes for grim reading. Knife attacks have taken place. Beatings are not infrequent. As is robbery. Gangs of intoxicated youths roam and prey upon those daring to mix in the community. PNG Police Commissioner Gari Baki attempted to paint a picture of even-handedness and fair play, that all would be in good hands come the day of the facility’s closure. The response from the Australian government, fringed by the complicity of PNG authorities, is crude in its simplicity: cut the water, the electricity, and the supplies. Starve the residents, more appropriately inmates, into submission. Drag them out; relocate them; deport them. What is startling is how conscious a strategy this has been, commencing, in fact, earlier this year. This is a mission of viciousness. Having been given a frightful ticking off by judicial officers for their role in facilitating breaches of the PNG constitution, the political figures are doing their best to scuttle and vacillate. The aim, it seems, is less the resolution of a problem than the continued infliction of harm upon individuals with legitimate rights to flee persecution and distress. That officials in Canberra persist in subverting international refugee law, not to mention colluding in behaviour that would, in many instances, be criminalised domestically, has corroded the integrity of Australian institutions.